Topics include anti-Catholic history, contraception, converts from Evangelicalism, Cardinal Sarah, "Amoris Laetitia", Islam, Benedict XVI, Fatima, millennials, liturgy, and more. Editor’s note: I somehow overlooked the November 14th article “New film asks: Was Malachi Martin an exorcist or an exhibitionist?”, which ranks #12 on now updated and corrected list. Prior to 2016, the most popular stories at CWR for three years in row (2013-2015) were about about attacks by radical Islamic groups. This year’s most read article is about polemical attacks: it is an interview with a Protestant professor and author whose most recent book addresses longstanding but factually-challenged assertions against the Catholic Church. The third most read article was also about Protestantism, the story of how many faculty members and students at an Evangelical seminary became Catholic. 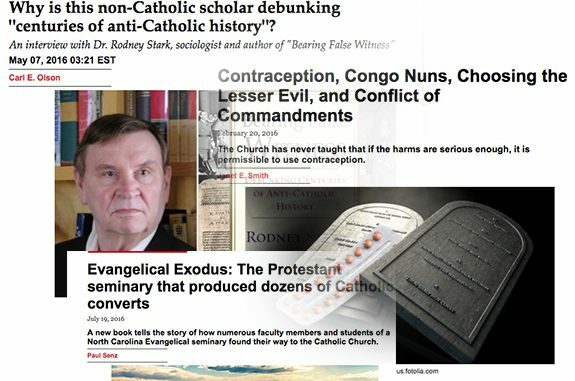 Many of the other top stories had to do with controversies and debates within the Church over topics including contraception, the “Catholic Spring” e-mails, Cardinal Burke and Pope Francis, pro-abortion politicians, the “four Cardinals”, and Amoris Laetitia. An interview with Cardinal Robert Sarah was #4, while an article by Cardinal Sarah was #19. Other top topics included the Diocese of Lincoln (#7), the movie “Risen” (#8), Benedict XVI (#10), the 10th anniversary of the Regensburg Address (#11), the 100th anniversary of Fatima (#12), millennials (#13), and Catholic schools (#17). The remarkable Fr. James Schall, S.J., who is in his late eighties, has three pieces in the Top 20; he remains one of CWR’s most prolific and beloved authors. 2). Contraception, Congo Nuns, Choosing the Lesser Evil, and Conflict of Commandments (Feb 20) by Janet E. Smith. The Church has never taught that if the harms are serious enough, it is permissible to use contraception. 3). Evangelical Exodus: The Protestant seminary that produced dozens of Catholic converts (July 19) by Paul Senz. A new book tells the story of how numerous faculty members and students of a North Carolina Evangelical seminary found their way to the Catholic Church. 6). Cardinal Burke: “No, I am not saying that Pope Francis is in heresy.” (Dec 19) by CWR Staff. In an interview with CWR, Raymond Leo Cardinal Burke discusses the current controversy over “Amoris Laetitia’ and the questions he submitted with three other bishops to Pope Francis. 7). A thriving Midwestern diocese’s secrets to success (Aug 25) by Jim Graves. Bishop James Conley of the Diocese of Lincoln discusses religious freedom, Catholic education, and what has made his diocese a powerhouse for priestly vocations. 8). “RISEN” Depicts the Resurrection as Historical and Theological Mystery (Jan 15) by CWR Staff. The cast and crew talk about AFFIRM Film’s new movie, starring Joseph Fiennes, which follows a Roman centurion’s hunt for the risen Christ. 10). Full text of Benedict XVI’s recent, rare, and lengthy interview (Mar 17) by CNA. In aninterview on issues of justification and faith, Benedict XVI has addressed issues of mercy and our need for forgiveness, salvation through the cross, the necessity of baptism, and the importance of sharing in Christ’s redeeming love. 11). Regensburg Revisited: Ten Years Later, A West Still in Denial (Apr 4) by Samuel Gregg. Irrationality not only manifests itself in violence but also in an inability to apply authentic reason to the many pressing challenges of our age. 12. New film asks: Was Malachi Martin an exorcist or an exhibitionist? (Nov 14) by K. V. Turley. The documentary “Hostage to the Devil” lets viewers make their own judgments about whether the controversial former priest and best-selling author was a sinner or saint, an exorcist or showman, a prophet or sophist. 13). Fatima at 100: The message of Our Lady for today (Jan 29) by Jim Graves. An interview with Fr. Andrew Apostoli, C.F.R., author of Fatima for Today: The Urgent Marian Message of Hope. 15). 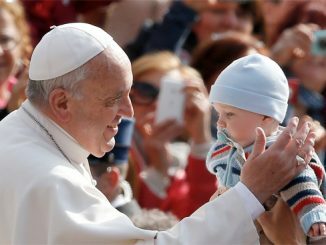 In Amoris Laetitia, who is admonishing whom? (Apr 8) by Fr. James V. Schall, S.J. In a document with much to recommend it, the final effect nonetheless is to lead us to conclude that no “sin” has ever occurred; everything has an excusing cause. 16). Five Serious Problems with Chapter 8 of Amoris Laetitia (April 22) by E. Christian Brugger. The most controversial section of Pope Francis’ apostolic exhortation is fraught with problematic arguments and dubious moral theology—and gives the German bishops all they want. 17). The “True” Islam (Jan 24) by Fr. James V. Schall, S.J. The writings of Rémi Brague, winner of the 2012 Ratzinger Prize, about Islam offer the sort of unflinching and detailed analysis often missing from papal utterances. 18). More Catholic schools are making the switch to classical curricula (Sept 23) by Leslie Fain. Most schools today are geared toward college and career-readiness. These schools aren’t forming children to be saints, say classical education advocates. 20). Silence in the Liturgy (Feb 10) by Cardinal Robert Sarah. It is important to recall that silence is a necessary condition for deep, contemplative prayer, and an important component of the liturgy. 21). Realism and Islam (Apr 17) by Fr. James V. Schall, S.J. Our leaders cannot comprehend what is going on, either when a whole Western civilization loses its faith and moral standards or when Islam reawakens to the implications of its own faith and its vision of world conquest. The Holiness of Fr. Walter Ciszek, S.J.